Increasing the share of the workforce that is covered by health insurance improves worker health. A state that chooses to expand Medicaid can expect a small increase in state costs, but that investment in health is likely to improve productivity by reducing absenteeism and underperformance at work. 2. Rebecca Mitchell and Paul Bates. “Measuring Health-Related Productivity Loss.” Population Health Management, vol. 14, no. 2, 2011. 3. Ronal Kessler and Paul Stang, editors. 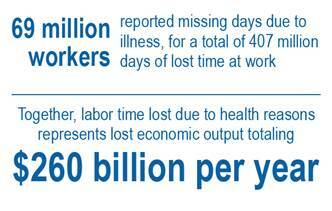 Health and Work Productivity: Making the Business Case for Quality Health Care. University of Chicago Press, 2006.